The Gaylord National Resort and Convention Center is a world-class destination at the new ​National Harbor development located along the Potomac River near Washington, DC. The $865 million facility features 2,000 guestrooms, flexible meeting and banquet facilities, six restaurants, a nightclub, retail shopping, a full-service spa and fitness center, indoor/outdoor swimming pool and outdoor event space. National Harbor will attract visitors from around the region with special events throughout the year, such as an upscale farmers market, food and wine festival, art festival, outdoor concerts, and movies. View the following photos and take a visual tour of the Gaylord National Resort. 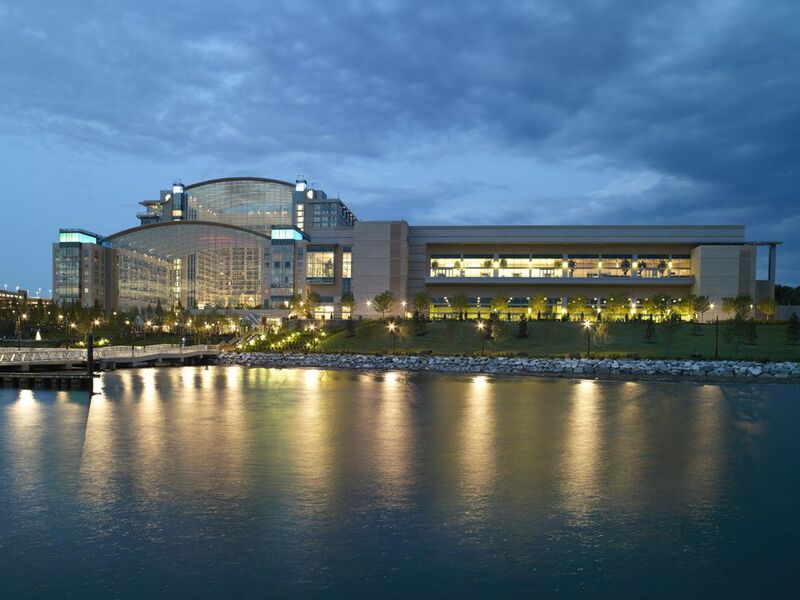 The Gaylord National Resort and Convention Center is the cornerstone of the development of National Harbor and is said to be the largest non-gaming hotel and convention center on the East Coast. The Gaylord National Resort and Convention Center can accommodate meetings and events for groups of 10 to 10,000. There are four ballrooms, 82 meeting rooms, and a 180,000 square foot exhibition hall. Small groups can enjoy more intimate settings throughout the hotel. The massive 18-story glass-enclosed atrium provides a unique and comfortable setting and reflects the region's history, culture, architecture, and natural beauty. ValleyCrest Landscape Companies built and will maintain the landscaping. National Pastime Sports Bar features a chic urban design with a number of unique sports artifacts, including a hand-carved, life-size statue of Maryland-native Babe Ruth, handprints of local sports legends and the official home plate used in the Washington Nationals final game at RFK Stadium. The sports bar boasts a 30-foot high-definition television and is open for lunch and dinner. One of the dining options at Gaylord National Resort includes the Pienza Italian Market, with six market-inspired stations including bread and antipasto, fresh produce, a rotisserie and carvery station, a pasta and risotto station and a traditional dolceria/sweet shop. Open for breakfast, lunch, and dinner. The atrium at the Gaylord National Resort includes two-story replicas of a Colonial-era mercantile shop and a Federalist-style farmhouse that house two of the resorts unique retail shops. National Pastime Sports Bar features a hand-carved, life-size statue of Maryland-native Babe Ruth, handprints of local sports legends and the official home plate used in the Washington Nationals final game at RFK Stadium. The Gaylord National Resort is set on beautifully landscaped grounds along the Potomac River. The Cherry Blossom Veranda is one of many sites that can be used for weddings at the Gaylord National Resort. With impressive nightly sunsets amidst the National Harbor Marina, sweeping views of Old Town Alexandria, and the Washington monuments in the distance, the Gaylord's Riverview Terrace offers an ideal backdrop for weddings, receptions, concerts, dinner parties and other special occasions.